When Estes Express Lines embarked on their journey into freight dimensioning in 2015, they did so with a strong commitment to improving their operations and pricing. While initially considering a handful of vendors, Estes used their best procurement practices to whittle down their list to two companies, FreightSnap being one of them. The two finalists agreed to side-by-side testing designed to compare their dimensioners in terms of accuracy and speed. Physical footprint and electrical requirements were also considered. 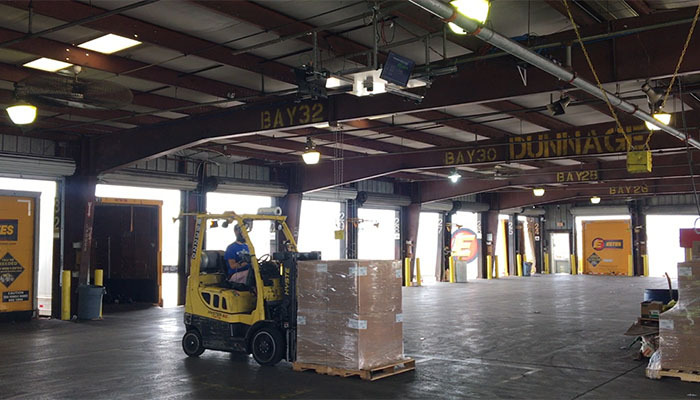 The tests were carried out at Estes’ freight terminal in Richmond, Virginia, where Estes’ operational and engineering personnel evaluated the FreightSnap FS 5000 dimensioner alongside a comparable competitor’s laser based product. They ran freight through each dimensioner, and then used a tape measure to confirm their accuracy. According to Estes, both units performed well over the two-month evaluation period, exhibiting near equivalent accuracy and speed capabilities, as well as demonstrating similar struggles with outlying freight. In the end, Estes chose FreightSnap’s FS 5000 due to its lower price point and potential for quicker ROI. “When I looked at the reports and spoke to our testing personnel on the dock, they were hard pressed to recommend one unit over the other. They seemed equally impressed with both units,” said Estes’ Vice President of Process Improvement Webb Estes. Estes’ initial RFP called for 23 units spread over 23 terminals. By the end of testing, Estes had decided to purchase 72 units in their initial order. They wanted to spread units out across more terminals and add multiple units at some of their busier breakbulk centers. “After testing, we went all-in on the project,” said Webb Estes. The initial implementation took a little over six months. Software customization was completed by FreightSnap, allowing Estes to access data and photos for each shipment through FreightSnap’s Density Management System (the front-end of FreightSnap’s cloud repository). Integration with Estes’ back office system was also performed, enabling Estes to supplement their legacy system with new and valuable dimensional data and photos of their freight. As the program was rolled out, additional features were also added to the dimensioners to promote greater process efficiency at the already busy breakbulk centers. Since the first implementation, Estes has continued to invest in new dimensioners throughout its terminal network. As of November 2017, the company has more than doubled its initial order of dimensioners with over 150 units now installed. The fact that Estes continues to grow the use of FreightSnap dimensioners indicates the fruitful nature of their investment. Today, dimensioners have been incorporated into the day-to-day function of the pricing division. Webb noted that going in, the company knew it was taking a calculated risk. “When we first made the decision to go with FreightSnap, they were a new company with a good product, but no experience rolling out a dimensioning program to the scale we were contemplating. As you can imagine, this made several of us very nervous. Initially there were some growing pains on both sides, but our team and the team at FreightSnap kept at it and worked through all of it. As time went on, installs were easier, integration became seamless, and the product speed and operation continually improved.